Ahaar is turning seven this month. Gosh, how has time flown by! And after all these years, I have some updates on the blog. It has taken me seven years to add a "About us" page to the blog. But it has one now. It also has its own Recipe Index. The recipe index is by no means complete, I have to add seven years worth of recipes. But they are coming. When I started getting the recipe index, it got me thinking about the first days. When I had just started blogging I wasn't sure I would last a year. How can anyone keep writing for so long and who will come to read my blog? Despite my fears, I persisted and slowly I gained confidence. I had a few visitors in the early days. Engaging in a conversation with other foodies helped. And as time went by, I was engrossed in this food community, where I have formed friendships, and learned so much from. I did some time travel and went back to the beginning. I wanted to see what was I blogging about in the first month of existence and who were the first visitors on Ahaar. This exercise was a blast from the past! I had 15 posts in the first month! I was certainly enthusiastic. 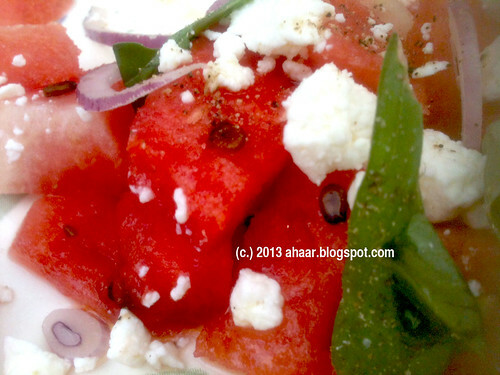 From salad,to khichudi, from pasta, to lamb curry, I had posted them all. Who was commenting on these posts in the early days? Who engaged with me on food conversations? It was interesting to go back and see. There were a few bloggers, some who were anonymous and some were friends. Some of the bloggers don't blog as often, but some are still going strong. 1. Sqrlta - my friend who now tweets under the same name. Both of us were housemates and shared food often. 2. 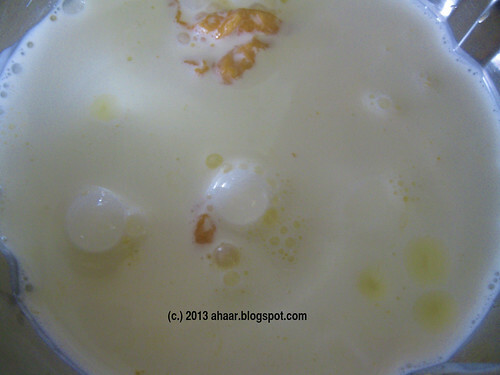 Indira of Mahanandi - her beautiful food pictures encouraged me to start my own food blog. 3. Archana of Spicyana - she was one of the first visitors and so generous with her time helping me figure out the html world. 4. Poppy Dey - she was one of the first Bengali reader and not always an encouraging one. She would nitpick my recipes and even has a rhyme criticing one of them. She has resurfaced and nothing has changed. Taking her off my list right now. 5. Manisha of Indian Food Rocks - she was one of the first to engage in a food conversation. She asked me "what do you put in your garam masala"? To celebrate 7th blogoversary I am doing a giveaway for the first time. I have come to cherish this space and all the connections and friendships I have made over the years and it's time to celebrate some. 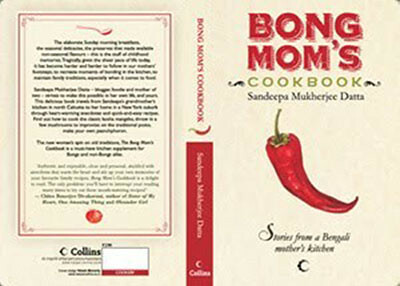 What better way to celebrate the blog than by celebrating fellow blogger Bong Mom's Cookbook newly published book by the same name. She has become a friend over the years and even though I haven't met her yet, I feel close through her writing which is as evocative as her recipes. And along with the book, there is a amazon gift card to be had as well. 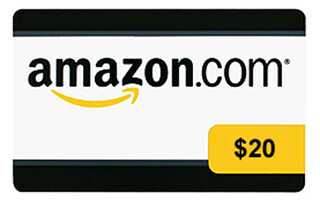 a $20 e- giftcard from Amazon! 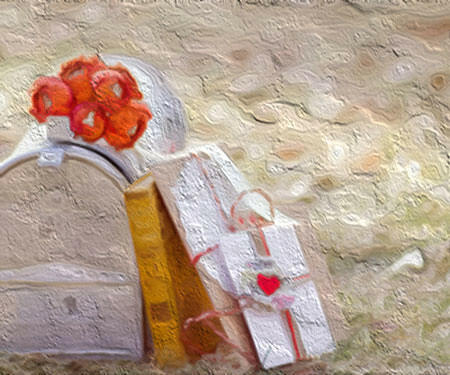 I will ship the book and the gift card anywhere so don't hold yourself back. You don't have to follow, or like, or subscribe to Ahaar. But it would be good if you did! You do have to comment and tell me something about you. Leave me a comment. I will do a winner's drawing in 3 weeks time. Thank you for your love and friendship, we love you back! 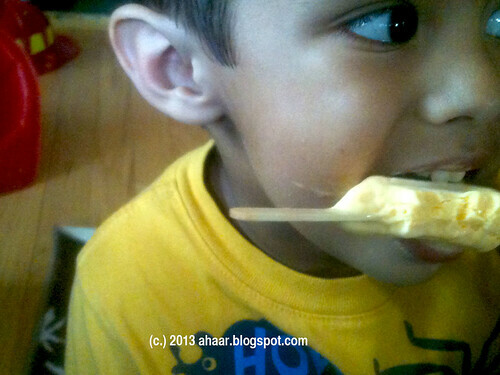 Lil A's new favorite is ice-cream and Popsicle! He demands one every day now. Considering that he wouldn't even eat ice-cream till he was almost 2, this is quite a turn-around. 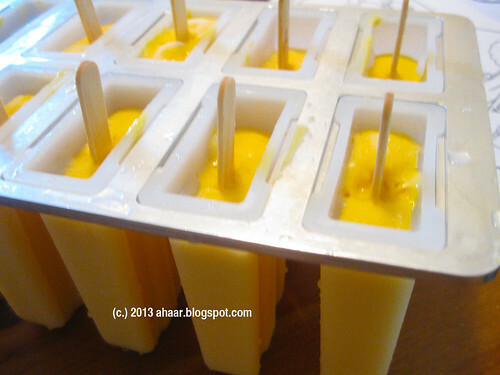 When we ran out of his recent stock, I casually mentioned to him that we should make some popsicle at home. I shouldn't have, or at least I shouldn't have till I had all the ingredients to make it right then! For the next two weeks he asked me, much like the 'Are we there yet? 'Verizon guy, "when are we making the popsicle?" He planted this bug in my head. I became all excited about trying to make popsicles at home. I ordered the mold and set to work with him one Friday afternoon and we had popsicles ready by the time we went for a playdate with Nina. 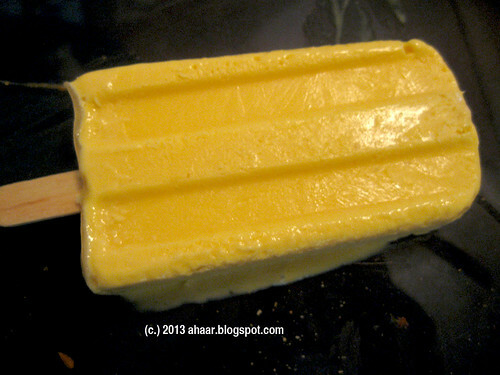 The evening was well-spent in the company of mango popsicles. Nina, her brother, and parents and all of us enjoyed our very own homemade mango popsicles. The last one was shared the next day by Aswin, Lil A and me. Lil A was so excited about getting his turn that he would yell "to me, to me," instead of "me too, me too." We are already planning colors and flavors for the next round. I can see a tasty summer before us. 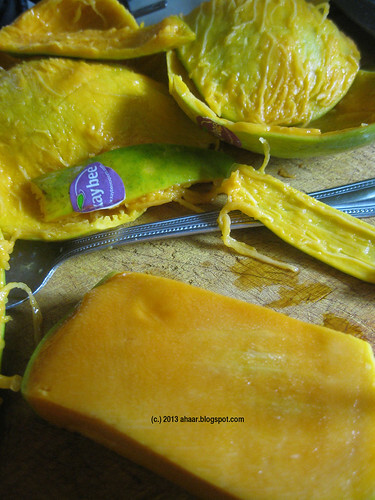 Add them in the blender and make it a smooth paste or a chunky one depending on your taste. Put them in the mold and freeze it for atleast 5-6 hours. Overnight is better. Run the mold under cold water (no hot water) until the sticks loosen. Enjoy the taste of summer! A friend recently gave us a cookbook as a gift. I haven't received a cookbook as a gift in a while, so I was curious about this one. 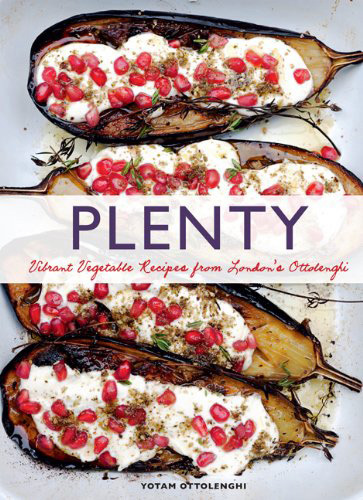 The book is "Plenty" by Yotam Ottolenghi, one of the hottest chef in UK, I hear. The book has a stunning photo on the cover and high reviews in press already. I liked the way the book is arranged around a central ingredient: pasta, eggplant, squashes, fruits etc just to name a few. This vegetarian cookbook takes his columns that have appeared in Guardian and put them in a book form with some beautiful pictures. It made me want to cook with it immediately. And I did! I have made a couple of recipes from this already. I will share them slowly. 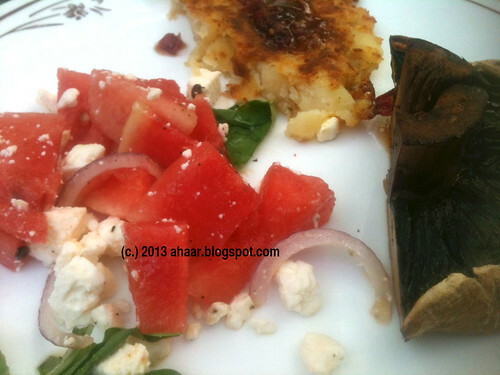 What I want to share today is the simplest recipe which is such a wonderful turn on watermelon. 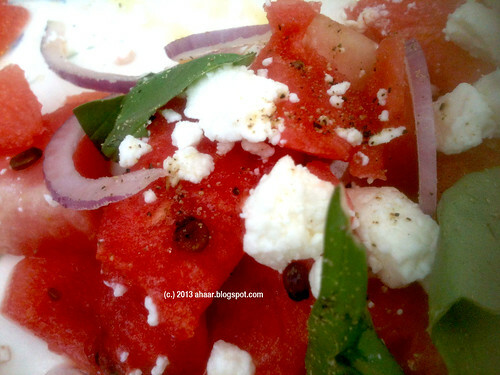 I have never really thought of making a salad with watermelon before. When I saw it in the book, I knew I had to try it for the little grilling party later in the evening. and the dessert was some blueberry yogurt cake. Cut the onion in thin slices. And cut the watermelon in small bite-size pieces. Mix them together. Add salt and pepper and mix one more time. Now add the feta on top and then the basil leaves. Add olive oil on top and serve immediately.